Camco 210 Plastic Cleaner/Polish - 14 oz. 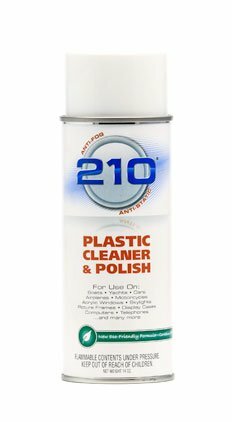 210 Plastic Cleaner/Polish - 14 oz. The professionals' choice for protecting and maintaining isinglass, plexiglass and vinyl. Anti-static, anti-fog and non-streaking. 210 Plastic Cleaner/Polish seals the pores in all plastics, leaving a protective coating with UV inhibitors to prevent browning and hardening. Provides plastics with a clear, lustrous look. *Not Available in Canada or California. Haz-Mat item, only ships by UPS Ground. Continental US only!